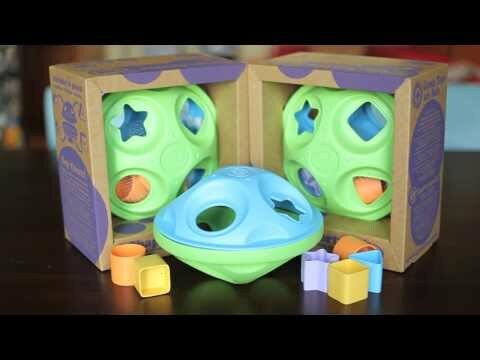 The My First Green Toys™ Shape Sorter puts an eco-friendly spin on a classic play pattern. Made in the USA from food-safe, 100% recycled plastic milk jugs that save energy and reduce greenhouse gas emissions, the Shape Sorter helps develop recognition of shapes and colors while also encouraging eye-hand coordination, problem solving, and fine and gross motor skill development. The two-part elliptical Shape Sorter and 8 colorful shapes (2 stars, 2 circles, 2 squares, 2 triangles) are the perfect size and weight for little hands. Each piece slides easily into the chute cut-outs on both the top and bottom of the Sorter, which opens with a simple twist, separating the two halves and letting the pieces out again.